Our friends at the Echo got a bunch of respected Liverpool bloggers (if we say say ourselves), to hand out our early season awards to our swashbuckling side. Here’s our Editor @Jordan_AC90‘s answers. Thoughts, Reds…? Coutinho. I thought about being edgy and saying ‘The Team‘, here – because Liverpool’s brilliance is undeniably the collective – but in equal measure, you can’t deny our Brazilian magician’s influence. His five goals and five assists only tell some of the story. Creatively, he’s been frightening and is finding the consistency he previously lacked. His free role on the left of a front-three maximises his goal-scoring potential and when his shots find the target on a more regular basis, he’ll be even more devastating. Still just 24, Coutinho is entering his peak and I desperately hope he fulfils it with us and not a Spanish giant. Still, he’s ours until the summer at least and we should enjoy every moment. 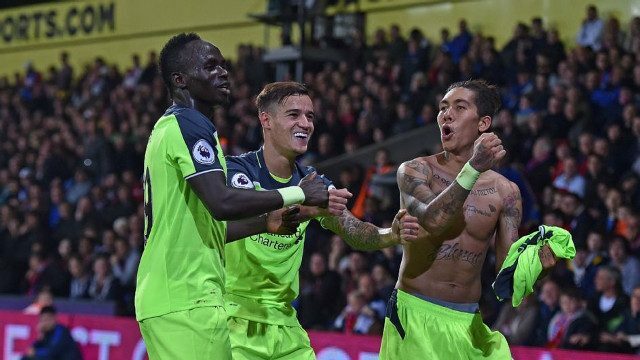 Coutinho could have his own Top 5 here, but I’m going to go with Sadio Mane’s debut wonder-goal against Arsenal. Before the season, there were claims we overspent and that Mane goes missing. He’s made those pundits look ridiculous. His goal against the Gunners gave us a 4-1 lead away at the Emirates on Premier League opening day, and when Mane jumped on Klopp’s back to celebrate, you had the feeling we’d be in for a ride this season ourselves… Mane has completely transformed our frontline and looks the most impressive signing since Coutinho himself. Jordan Henderson. It seems odd to suggest the captain as a ‘breakthrough’, but the fact is there were very real doubts he had a long-term Liverpool future at the end of last season. Not from management, but certainly from fans. He broke through between 2013 and 2015 but a sloppy campaign during Jurgen Klopp’s debut term meant he’s had to do it again. He was behind Emre Can and James Milner in the central midfield pecking order last term and couldn’t get in the England team at the Euros. Now, he’s a guaranteed starter for both and captains his country, to boot. Henderson’s taken to the no.6 role in a manner few thought possible. From his deep-lying, pivoted position, Henderson’s covered more ground and made more passes than any other player in the top flight. When N’Golo Kante was registering stats like these last term, pundits were losing their minds, but Henderson’s registered two assists and scored once too. Quality. So good that I wouldn’t even consider swapping him for Pep Guardiola, Diego Simeone or anyone else. In hiring Jurgen Klopp, we achieved the managerial equivalent of capturing Lionel Messi or Cristiano Ronaldo. That’s how good he is. Every major decision he’s made is proving correct. Not buying a left-back and going with James Milner. Playing Roberto Firmino centrally and dropping Daniel Sturridge. Signing ‘inconsistent’ Premier League stars like Mane and Gini Wijnaldum. Everything implemented since our Europa League Final defeat has been merited and so far successful. If that wasn’t enough, we play a jaw-droppingly attractive brand of football and outscore every side in the country. Not even under Rafa Benitez following Champions League victory have I been so confident in a Liverpool boss.